St Mark’s is proud to support Sheffield Pride with a weekend of rainbow-themed activities: on Saturday 30July we will be joining the Pride March with our ‘Christians at Pride’ banner, and hope that many of our LGBT+ friends will visit our stall at the Endcliffe Park Festival to experience the unreserved and warm welcome of our church community. The celebrations continue on Sunday 31 July when we will welcome guest preacher Jayne Ozanne, a member of General Synod who through her writings and broadcasts is helping the Church develop and promote a positive Christian ethic towards lesbian, gay, bisexual, transgender and intersex people. Over a BBQ and games discussions and fun continue into the afternoon until Night Service draws the weekend to a close with time for quiet reflection, acknowledgement of the pain, prejudice and discrimination which impacts on the lives of LBGT+ people, but also gratitude for progress made. Following the attack on a gay night club in Orlando in June this year, the statement we issued on our website expressed our longing for the day when all people might live free from fear and prejudice, in mutual understanding, acceptance and love, and we committed ourselves to being part of its realization. 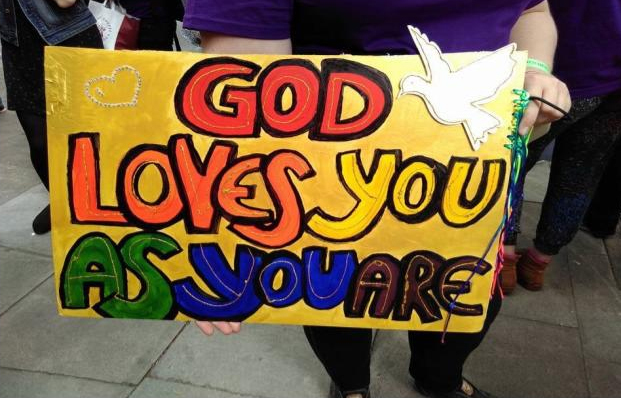 Taken part in Pride as a church community is a step on this journey, is using our voice to tell all that “God loves you as you are’.